Last season, Vail Resorts began a new program to develop a better understanding of how the condition of the equipment we use impacts our ability to experience a fall or navigate difficult snow conditions without suffering a knee injury. The equipment inspection program was born out of an understanding that most of us are not formally trained to assess boot wear or the proper way to mechanically test the effectiveness of ski binding’s forward pressure/lateral release or the knowledge of whether a boot is compatible with a specific binding. 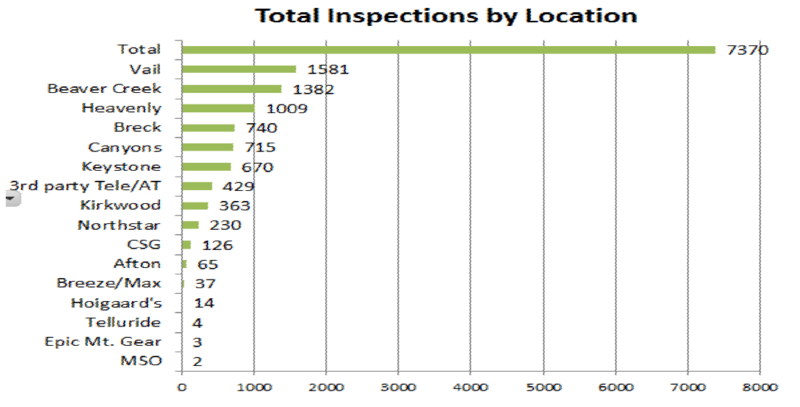 Below is a record of the total pieces of equipment inspected by Vail Resorts Retail(VRR) during the 2014-2015 season. In addition to their inspections, Northstar completed 750 additional inspections through their Ski and Ride School rental group. Knee injury severity: Injuries involving tested/calibrated equipment were less severe than those on untested equipment. The large number of replacement toe and heel pieces purchased through VRR indicated how many of us were skiing on worn boots that did not interface effectively with alpine bindings. Numerous employees discovered that their Alpine Touring boots were not compatible with their bindings. The worst case scenario was an Alpine Touring boot paired with an Alpine Binding. This combination has been responsible for many knee injuries in our sport. One of the successes of the program has been recognizing this issue and identifying proper equipment interfaces. While the current data supports the effectiveness of this program, this remains a dynamic field with constant changes in technology and equipment. We will continue to adjust the program based upon feedback and the measurement of its effectiveness in reducing knee injury severity and knee injuries in general. The lessons learned from having more than 8,000 pieces of equipment checked through our VRR partners has lead to more locations being added at some resorts. Additionally, through better coordination, we will be able to have better outreach to Welcome Backs, Broomfield and Patrol and Ski School Refreshers to make the process easier for employees. Brands such as Fischer or Elan that had issues being inspected will be available this season for inspection. Compatibility Chart: VRR has worked with boot and binding manufacturers to develop a compatibility chart that spells out their compatibility. These are individual manufacturers requirements and will be our standard for determining what equipment works appropriately together. As such, Alpine Touring equipment will no longer be inspected by third-party shops. We will move these inspections to our VRR rental locations. Some combinations of alpine touring equipment will not be inspected using a standard torque test due to manufacturer requirements and will only be inspected only for compatibility. These combinations are noted on the VRR compatibility chart and can be stickered by the operation department’s designee as well as VRR. Snowboard and Telemark Ski Equipment will be inspected and stickered by the operational department designee, not by VRR. Inspection guidance is provided with the SOP. VRR will begin inspections in September and recommends all alpine boots be inspected this summer so replacement pieces can be ordered in advance of the ski season. Employees will be provided vouchers to make the process clearer for supervisor tracking. Employees who wish to have additional vouchers for more equipment inspections will be issued vouchers by their department as needed. Employee requirements: Employees will have each piece of equipment used in the course and scope of their employment certified per this procedure within 30 days of the employee’s first day skiing/riding for work. After the first 30 days of work, employees may not use equipment during the course and scope of their employment that has not been tested and passed inspection. Employees are expected to have the binding settings at the manufactured recommended settings. Department requirements: Ensure compliance with this program, regularly monitor employees’ equipment to ensure valid inspections exist, issue employee vouchers, and maintain an auditable record keeping system for the department. Our continued goal for this program is to gather as much information as possible to measure the positive impact of equipment inspections for our employees. The collection of information concerning knee injuries, the role equipment may or may not have played when an injury occurs and the growth of employee’s understanding of their equipment will pay dividends for the employee as well as the larger Vail Resorts community. Improvements will ensure that more employees will be able to efficiently have their equipment checked and experience less frustration from the process. Specific information on your local programs will be available through the local VRR stores or your Health and Safety Department.